As occupants of the lowest lying state in the nation, residents of Delaware face the danger of roadway flooding regularly. Consequentially state agencies like the Delaware Department of Transportation (DelDOT) have made it a priority to monitor the status of roads, issuing flood warnings and closing roads that might prove dangerous to drivers. The conventional sensors that track flood levels across the state are expensive to install and maintain. Because of that cost, DelDOT has had to prioritize the monitoring of only areas with the highest risk of flooding. But the University of Delaware's Center for Environmental Monitoring and Analysis (CEMA) is looking to change that. DelDOT has worked with CEMA on several projects in the past and knew it had the expertise to address this flood monitoring challenge, so the state agency provided a grant to the center to experiment with potential solutions. Using that funding, several low-cost flood sensors that could be used to augment DelDOT's current flood-monitoring system were developed by CEMA Associate Director Kevin Brinson; CEMA Research Associate David Huntley; Matt Shatley, CEMA's research computing specialist; and Sean Hudson, a doctoral candidate in the Department of Geography. The devices could cost as little as $150 each and require minimal maintenance, which could allow DelDOT to monitor roads that flood less regularly as well as the regular trouble spots, providing the agency with a more comprehensive monitoring system to keep Delaware drivers safe and informed. CEMA tested several simple but effective means of sensing the flood levels of roads. Each utilizing a different type of technology (sonic, optical or resistance), the sensors all relied on a relatively cheap yet efficient microcontroller called an Arduino. These mini computers are versatile, with the capacity to do much more than simply detect water levels, and are often used in environmental sensing, home automation and other applications by hobbyists and professionals alike. All three of the tested technologies were found to be successful in the field, though Brinson noted that certain methods may be more appropriate for certain environments. He emphasized that the intent with this field test was not to find a single cost-effective method of sensing floods, but rather multiple. By having several methods at their disposal, government agencies like DelDOT can implement a sensor most appropriate to the environment in need of monitoring. To use the low-cost sensors to expand flood monitoring, a network of multiple sensors in an area would transmit information wirelessly to DelDOT. These transmissions would likely range from periodic connections to indicate the system is still functioning to potentially three simple notifications: water is approaching the roadway, water has covered the roadway and roadway flooding has reached a dangerous depth. In pursuit of cutting costs even further, Brinson is looking to road signs and other roadway structures as potential installation points. Their abundance along road sides could not only provide convenient, pre-existing installation structures, but could also minimize vandalism. "No one notices sign posts, they just drive right past them," Brinson said. "We could put our sensor box on the back of it, and you would never know it was there." 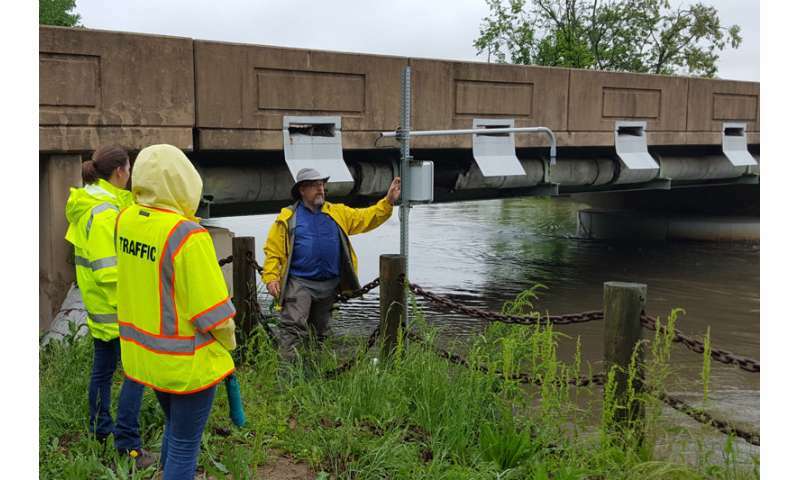 Regarding the future of this technology, the project manager of the low-cost flood sensing project at DelDOT, civil engineer Silvana Croope, indicated that she hopes to have it further tested and out in the field by summer 2019 at the latest. "We will start discussions on this comprehensive implementation plan at the end of the fall," Croope said. "But because we already have an initial strategic study that CEMA put together, we actually already have a road map for us to start the deployment."